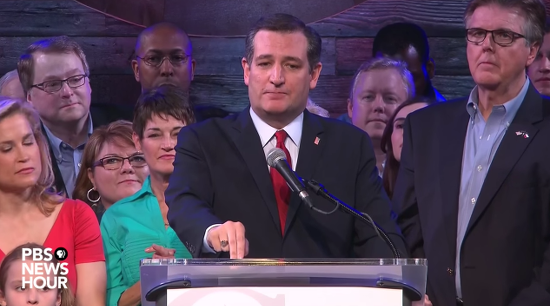 After winning Oklahoma and Texas on Super Tuesday (he also went on to win Alaska), Republican Ted Cruz urged other candidates to “prayerfully consider” dropping out. Which is probably good advice, considering what God did to Justice Antonin Scalia on Cruz’s behalf — and that was just to make a point to the Republican electorate. Still, it’s kind of an odd request. I mean, one of the reasons the 2016 Clown Car had to be upgraded to a Tour Bus was because of that prankster God, telling half the party to run. (I mean, Ben Carson? Really God?) Now it seems God’s had His fun, and it’s time for everyone else to make room for Ted Cruz. So I guess the joke’s over.